I realized I had been continually trying to live in my own strength. Sort of like trying to move forward, while at the same time not letting go of the past… I was grieving for my old life. I liked my long, albeit sometimes frizzy, hair. I liked being fit and knowing what worked for my body…and not having to worry about surgery and who would be bringing meals or taking care of my son. I long to go back to the days before cancer ever entered into my medical portfolio. I met Erin several years ago… before her battle with cancer. I remember the day I heard of her diagnosis…and the feeling of shock and worry about one so young receiving that news. Yes, I know that cancer happens at any age – but breast cancer isn’t supposed to affect my friends, right? After all, my peers and I were still in the carefree zone. The self-check-if-you-think-about-it zone. The seven-years-before-I-have-to-schedule-a-mammogram zone. Breast cancer couldn’t be found on my list of things to worry about – at least, in my case, it wasn’t anywhere near the top. But cancer is no respecter of persons – and this, my friend Erin, found to be true. Her book, Through Waters Deep, is a candid version of her experiences before, during and after the cancer verdict. I attended a women’s conference where Erin was the speaker. I sat there listening to her, amazed by her ability to find joy in spite of how much her life has changed. It was nothing short of inspiring. I realized in a greater capacity how much I take my health for granted… and I was humbled. More than that, I was encouraged by Erin's view of life now. While she may grieve the loss of who she once was, she has found a way to embrace the life she has today. A life that is different, yes, but a life worth living nonetheless. A life with so much to offer this world. If you have lived with cancer, you’ll understand Erin’s journey all the more, but either way, I can assure you that you’ll find encouragement inside the pages of this book. If you're looking for an inspiring story, may I suggest hers? You can order your own copy of Erin’s book here. Erin is a pastor's wife, mother of two (she has a beautiful story of adoption to share), blogger and American Cancer Society advocate. You can follow more of Erin through her blog 'Beyond the Backyardigans' and on Facebook. 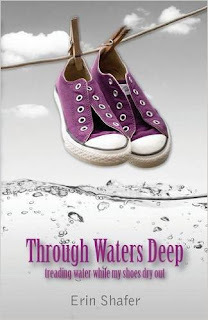 Would you'd like to win my personal copy of Erin's book, Through Waters Deep? Giveaway winner will be announced Saturday, January 16th!